There’s a verse from Song of Solomon that I read a couple months ago and it has gotten stuck in my head and in my heart. So, I decided to write about it (that’s what bloggers do, right?). 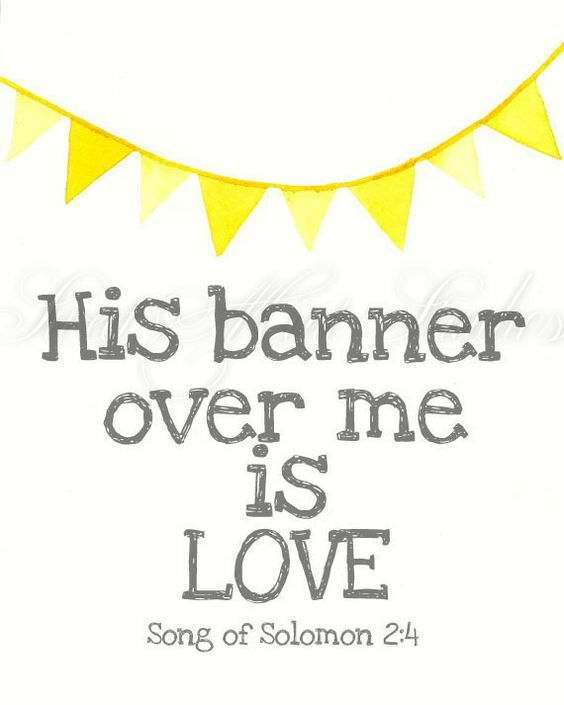 It’s verse 2:4, “He has brought me to His banquet hall, and His banner over me is love”. I love imagining what that looks like. I just imagine God walking me into this elegantly decorated banquet hall filled with flowers and white table clothes draping over the long tables as He holds a gorgeous banner high over my head that tells everyone at the banquet that I am His. “His banner over me is love.” Love is my name tag. Love is how I’m known. It’s how the world will recognize me. I want that to be my story, and I deeply want that to be yours. Unfortunately, more often than not, we are standing under banners that say drastically different things. I have a strong feeling that “love” is probably not at the top of that list. The other morning I grabbed a cup of coffee and decided to make a list. A list of what words I was actually allowing to define me. What words I was wearing around like a name tag. The words that I had come to believe about myself. And as I began writing, tears began to fill my eyes. The words were devastating. Can you picture me walking into a networking event with these words Sharpied on my chest? “Hi, my name is Awkward,” As absurd as that sounds, that’s exactly what I had been doing! I was going into friendships, relationships, introductions, meetings, experiences, moments, with these words scrawled on my heart. The truth is, that the longer we wear those names around, the harder they are to get off. So that morning, for the first time in my whole life, I began to question the things I had always believed about myself. I began to sort through the words I had trusted for so long. I picked them up one by one and started to examine them. It wasn’t easy, and it definitely wasn’t fun. I wondered where those thoughts/ideas about myself started and why I had allowed them to live there for so long. And as I was scuffle through all these different emotions and labels, I began to wonder what EXACTLY God said about me. I was desperately hoping that His name tags would look much more like love than mine did. And so I decided to find out. I spent hours that morning combing through the Bible looking for the words God uses to define us. And it was on that day that I realized that NOTHING I had believed about myself was actually true. I had been living under a banner of lies. God said I was chosen, that I was enough, perfectly and wonderfully made, that there was no flaw in me. I had read so many of these same verses before, but that day they meant so much more to me. I scribbled them down as fast as my hand would write. After hours of shifting through the Bible to find who God said I was, I had my list! A list of words that God uses to define us. I realized that if I wanted to think differently about myself, I was going to have to get a new name tag, because mine would no longer work for me. I was going to have to replace the thoughts I had believed for sooo long. The lies that I had gotten so use to believing. I decided to actually create new name tags. Don’t worry, I didn’t actually walk around with a name tag saying “Hi, my name is Enough”, but I took sticky notes and decided to decorate my agenda with them. I needed to be reminded each day of the things He said were true about me. And over time I began to wear those names proudly. Next Ladies, Don’t Get Lost In His Mixed Messages.